Make sure you get the most from your social media campaigns. 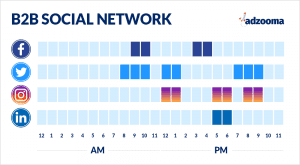 Boost your engagement and impressions by learning the best times to post on each platform. Social media changed the online world. It has billions of users worldwide and keeps on getting bigger. In fact, there are predicted to be 2.77 billion social network users around the globe by 2019. Every day, more and more businesses are signing up to take advantage of social media. And with some companies seeing their ROI (Return On Investment) improve by up to 119%, it’s not hard to see why. Using social media for your business brings a range of benefits. For example, it makes your company more accessible. If your users have a problem or need to get in touch, they’re likely to try you on social media first before picking up the phone. If you reply quickly and provide great customer service, your customers will spend on average 21% more on your products. So, you’ll increase your profits by being more accessible. As over half the people on social media interact with brands more than once a month, social media is also great for building relationships with your customers. Building on these relationships will increase customer loyalty to your brand, which in turn will increase your sales and profit. In addition, 60% of customers will tell their family and friends about a brand that they’re loyal to, expanding your customer pool. Plus, every time someone shares or interacts with your posts, you’ll get noticed by a wider audience, making it an excellent way to expand your reach. Convinced about social yet? Great, let’s discover the best times for you to post. When Are The Best Times To Post? Generally, the best time to post depends on the platform you’re using and the customers that you’re appealing to. If you’re using tools like SproutSocial, they include features that can automatically create schedules based on how many posts you’ve got queued up and ready to go out. But features like this aren’t always the best for your company. Some posts are more important than others – and will need to go out on the days and times that they’ll get the most impact. That doesn’t mean that as soon as you know the best times to post, that’s the only time you post. You shouldn’t just rely on a strict posting schedule. If you’re just posting every Monday, Wednesday and Friday at 12pm exactly, your users will start to notice. It makes your accounts look unnatural. It makes them look overly set-up and fake, which goes against the ‘in the moment’ and ‘real time updates’ selling points of the platforms. Weekdays are the best time to post on Facebook, particularly in the daytime between 10-3pm. Thursday is the most popular day for Facebook, with TrackMaven showing that Thursday at 8pm is a key time to post. Wednesdays are also popular on Facebook, particularly between 12-2pm. On the weekends, 12-1pm shows the most engagement. If you’re B2B (Business to Business) the best times to post are around 9am and 3-4pm on a weekday. This is most likely as people prepare to start a normal working day and when they need a break in the afternoon. For B2C (Business to Consumer) companies, the best times are 9-10am, 12-1pm and 4-5pm. This shows that these customers are likely to check Facebook on their lunch break, as well as the start and end of their day. 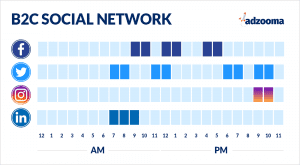 Twitter also sees the most engagement during weekdays, particularly around 3pm. To SproutSocial, Friday is the best day to post, especially between 9-10 a.m.
Sunday mornings are the worst time to post and show the least engagement. Co-Schedule have found that people use Twitter the most when they’re waking up, winding down or commuting to and from work. For B2B companies, the best time to catch people is 8-10am, midday and 7-9pm every weekday. B2C companies also have a similar timeframe, offering 7-8am, 11am, 6pm and 9pm as peak times to post. Instagram is another social network that’s regularly checked during people’s lunch hours, with the best time to post between 12-1pm during the week. The platform sees the most engagement Tuesday – Friday, between 9am-6pm. Sunday is the least engaging day to post. For B2B, it’s best to schedule posts around lunchtime in the weekday, but 5-6pm and 8-9pm can also drive engagement. For B2C, lunchtime is also a great time to post. However, it’s recommended to also expand the posts into the evenings and weekends, with 9 pm proving to be a popular time for engagement. As a professional network, LinkedIn should not be used on evenings or weekends. Tuesday – Thursday are the best days to post, between the hours of 7am-6pm. Wednesday 3-5pm sees a spark of engagement and is the best time to post on the platform. Generally, both B2B and B2C businesses will see the same amount of engagement for posting during the weekday, particularly in the morning, lunchtime and early evening from 5-6pm. However, B2B companies posting news updates will see more engagement in the morning 7-9am, as many users check the platform before starting work similar to a newspaper. Pinterest is more commonly used during weekends and evenings, with Friday and Saturday being the best days to post. Off-peak hours work better for this platform, with peak times of 2-4pm and 8-11pm. 2-4am is also a highly engaging time to post on Pinterest, capturing those who use the platform when they can’t sleep or wake up early in the morning. Ready to achieve social media success? These guidelines are great as a starting point – but they won’t magically fit every business out there. You need to monitor your results and data and see when your customers are online and interacting with your posts. See if posting at these times effects your engagement and response rates – until you’ve got an optimum posting schedule to really get the most from your posts. The temptation when starting out in social media is to get yourself online on every single platform. After all, if one business can profit from Facebook, you can too right? The truth is that most businesses won’t need every platform. Each one has their own purpose and type of customer. You should stick to that. Let’s say you’re an artist that sells your designs. Visual platforms like Instagram will work really well for you, as your customers will be able to see your designs in the best light. But more professional ones like LinkedIn aren’t going to see you much good. If you choose the wrong platform, all you’ll be doing is wasting valuable time and energy building your profile on a platform that your customers won’t even see. So, save your budget and time for the ones that matter. Social media posts aren’t just thoughtless bits of content. All of it should have a purpose. It should be on brand and on message for your company. Otherwise, you start to promote a confusing image of your business. There has to be a reason for people to follow you. You can’t just blindly post sales messages. These posts aren’t engaging and offer your followers nothing in return for following you. Instead, link your followers to useful content (such as from your own blog). Keep them updated with exciting news and events. Interact with them and build relationships. Get involved in relevant discussions that position your company as an industry leader. Knowing when your customers are online won’t just help with your social media. It’ll also help boost your other marketing campaigns, including your PPC ads. With Google Ads, you can target for this exact thing. Teamed up with our advertising platform, you’ll have all the tools you need to make the most from your PPC campaigns. Analysing every aspect of your Google Ads account, our opportunity engine will identify where you can cut wasted spend, increase your click-through rate and get a better return on investment. Interested? Get started by taking your FREE 1-Minute Health Check today. Currently writing lots of words about all kinds of unique subjects at Adzooma and searching for a word I like more than discombobulated. I have a masters in Film and Television, so I can tell people I know what’s good on Netflix. Outside of copy and away from a screen, you’re mostly like to find me spinning round on a pole. Or, if you already have effective Google AdWords campaigns running, click here.